Among the many gifts that Italy has bestowed upon the world, culinary and otherwise, pesto stands alone. The exact birthplace of pesto, that herby sauce made of pine nuts and olive oil, is an area of Italy called Liguria, whose microclimate is particularly kind to basil, one of pesto's key ingredients. What we love most about pesto is how easy it is to make. It's a rare "no-cook" sauce that you can blend with a mortar and pestle or make in a food processor. Its ingredients are simple: basil, pine nuts, garlic, olive oil, and aged Italian cheese, usually Parmesan. This is how a traditional Italian pesto is made. However, what many people don't know is that you can modify the basic structure of pesto to create your own unique versions. With apologies to Ligurian purists, the results may not be a traditional pesto, but they are savory alternatives that you can quickly whip up with ingredients you already have in your refrigerator. The green in pesto usually comes from basil, a staple in much of Italy's cuisine, but if the grassy flavor of basil is not your favorite, you can easily substitute it with any leafy green herb. Cilantro, watercress, parsley, mint, arugula, or any combination thereof will do. Over on Food 52, Phyllis Grant recommends using cooking greens like spinach, kale, or broccoli. As you experiment, you'll start to taste the notes that you really like. Keep in mind what you plan to serve with your pesto as well. Are you tossing it with pasta? If it's for pizza, what veggies, if any, will also be on there? And if it's a rub for barbecuing that you're making, the more fragrant your "pesto," the better! According to DeLallo Authentic Italian Foods, the pine nuts in traditional pesto originated from the Stone Pines that grow in abundance in Liguria's Apennini Mountains. Go further back in history and you'll find in literature a salsa di noci (walnut sauce) which came from the Middle East. 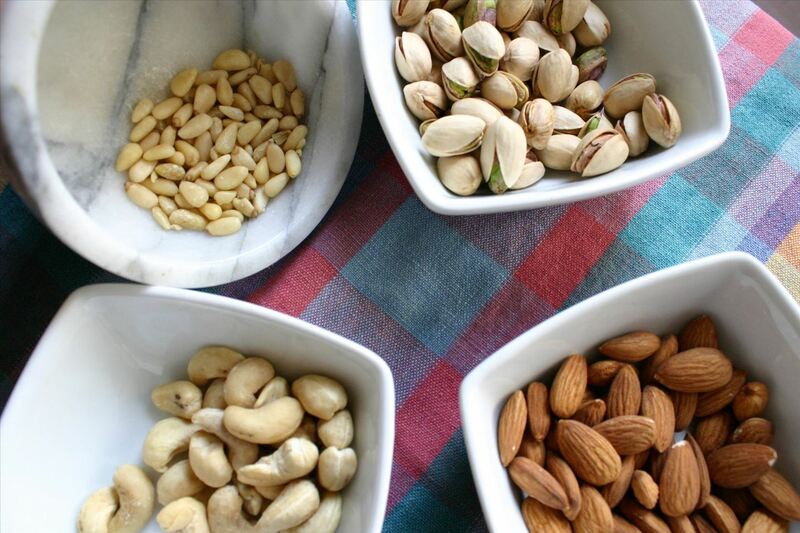 So while pine nuts are traditional, they can be replaced by almonds, cashews, pistachios, or walnuts. If you or one of your diners has a tree nut allergy, consider substituting sunflower seeds or soy nuts instead. Plus, there are two big advantages to swapping out pine nuts: price and avoiding "pine nut syndrome." Pine nuts are notoriously hard to harvest and demand has grown while crops have declined. So your wallet will be a lot happier if you go with a cheaper nut for your pesto. Meanwhile, starting around 2008, people around the world reported strange cases of pine nut-related dysgeusia. Dysgeusia is a syndrome where things suddenly start to taste bad/bitter/weird and doesn't go away. 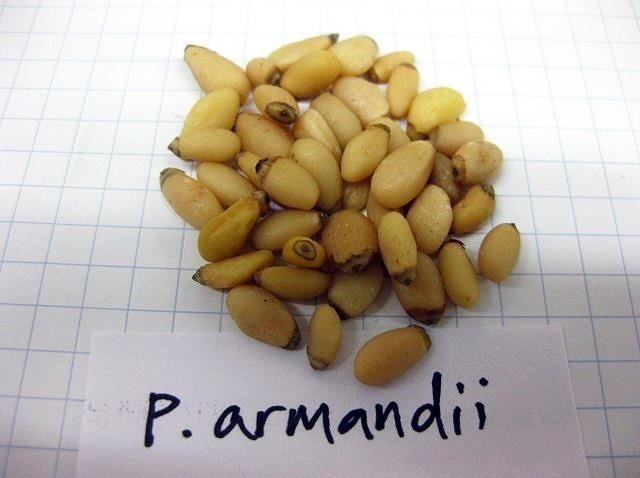 In this instance, scientists identified the issue as a species of pine nut, Pinus armandii, that originates in China. Researchers believe that the fatty acids in this strain of pine nut interferes with the taste receptors in your mouth. To make truly outstanding pesto, a mortar and pestle is the best way to go. When you work by hand, you have more control over the final product. Plus, with a mortar and pestle, you won't over-process the delicate herbs and damage the volatile oils that make them so aromatic and delicious in the first place. Serious Eats actually did a side-by-side taste test of fresh pesto made with a food processor and a mortar and pestle, and the old-school method won, hands down (pun intended). If you are using a food processor, put the removable parts of the processor (especially the blades) in a freezer beforehand to reduce the heat created during the blending process. Next, add all of the ingredients at once and mix them as quickly as possible, stopping every few seconds to scrape off the walls of the processor. 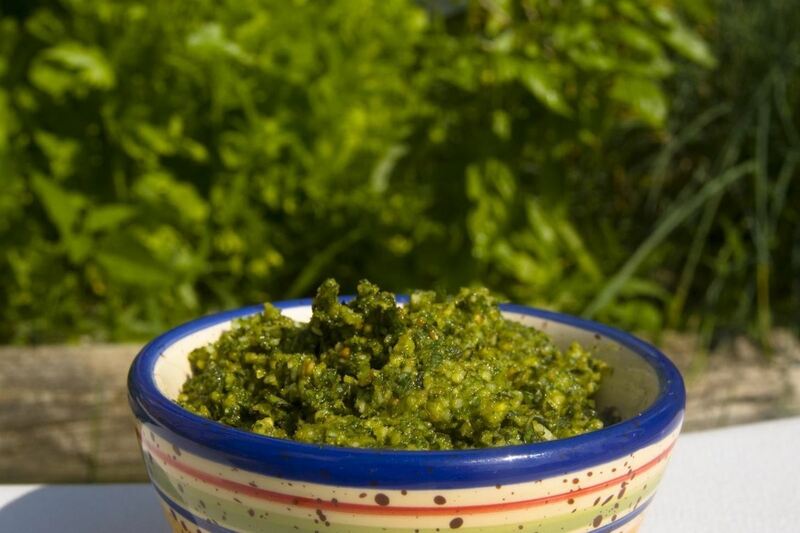 This vegan green pesto is made with pistachios and parsley in a food processor. If you are using a mortar and pestle, begin with your garlic and greens, (leaves only), and grind them. Add a dash of coarse sea salt and once juice develops at the bottom, add the nuts. Your nuts can be raw or toasted to bring out their flavor. A little crunch is fine. Once you grind that ingredient, it's time to add whatever grated cheese you've decided on. Tradition calls for Parmesan and Reggiano, but you can use any hard cheese you'd like. Grind the ingredients some more. A nice green paste should have developed by now. Add the extra virgin olive oil slowly while mixing the paste with the mortar. Add as much or as little salt as you need and now you have the best pesto of your life. 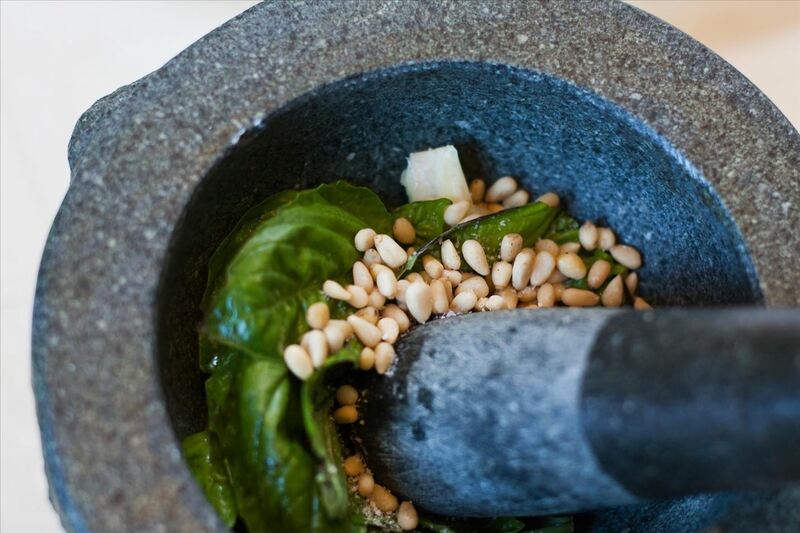 This pesto recipe is made with basil and toasted almonds using a mortar and pestle. One final suggestion is to consider seasonal ingredients to make your pesto. A mint and pistachio pesto will work well in the summer, while a watercress and walnut pesto might bring your end-of-year holidays to life! Try out different combinations and let us know what you've come up with!